The owners of this 1899 house faced a challenge: disturb the home’s small-room structure — pushing out the back wall to allow for a new mudroom and a more functional kitchen and opening up the first floor for more modern living — while making it appear as if they hadn’t. The homeowners, Kiva Construction and Tremmel Design Group worked to ensure historic integrity. They milled trim moldings to match the original window and door frames. To create a seamless connection between the new kitchen and the rest of the interior, they replaced worn fir floors with quarter-sewn oak throughout, typical in older homes. If you don’t know where the old walls were — you can’t tell. Kiva Construction made sure the new construction matched the old. They engineered wooden corbels to mimic the originals, and today you see these on the eaves as well as below the mudroom roof. 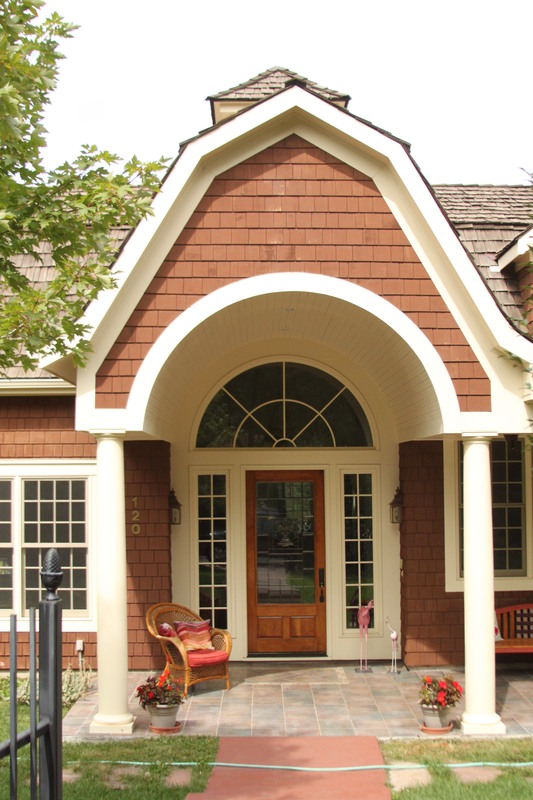 Concrete siding replaced vinyl siding, creating the deep shadow lines appropriate to the home’s era. Once painted, it’s nearly impossible to distinguish the old siding from wood! Likewise, the team chose other materials and design elements to create a historic feel, including the “Victorian” concrete tiles in the mudroom and bathroom. All door hardware is period reproduction. A 60’s era mantle in the living room made way for a 1903 mantle brought from the owner’s family home in Nebraska. In digging out the fireplace, the owners found the original hearth tiles and put them back in place. This 1920 home is an outstanding example of Craftsman Chalet design, which was popular in the Old North End after World War 1. The design marked a reaction to excessive Victorian ornamentation and a return to simplified house forms and natural materials that blended into the landscape. Classic features of the Craftsman style include the home’s low-pitched gable roof, exposed rafters under the eaves, rustic details such as time braces, small-paned windows, a Yount’s greenstone foundation, and a Van Briggle fireplace. Craftsman design catered to the rapidly growing middle class and the demand for affordable homes that incorporated modern features, such as electricity, central heating, and plumbing. Ruth Aldridge purchased the home from the original owners in 1927. Her husband, Robins P. Aldridge, owned Aldridge Mercantile Company. While we know little about Ruth, Robins Aldridge actively participated as a member of the Broadmoor Golf Club, El Paso Club, and Garden of the Gods Club; he was also active in the Boy Scouts. The Aldridges owned the house until 1944, when Harold and Carolyn Hawks purchased it. Harold Hawks, who died in April 1977, served as a vice mayor of Colorado Springs and sat on City Council for 16 years. A passion for civic engagement continues with the current residents. You won’t want to miss the “flag room”, which displays an impressive collection of American flags dating from 1859. Frank and Effie Stockdale, first owners of this distinctive 1933 Spanish Colonial Revival style home, lived here for 19 years. Frank co-owned the Birdsall-Stockdale Motors on North Nevada Avenue, which sold Packards and Pontiacs. Texas Rancher Oscar Appelt and his wife Josephine owned the home from 1952 – 1968. In 1945, the Appelts purchased 150,000 acres, considered then the largest ranch east of the Rockies in Colorado, and consolidated it with several smaller ranches south of Colorado Springs, including the property known today as Chico Basin Ranch. Oscar lived most of his time at the ranch, while Josephine resided here in town. The Spanish Colonial Revival style features decorative wrought iron, red tile roofs and window awnings. The entry archway theme recurs in the living room windows, the French doors and in the entryway to the dining room. Of particular note, the original living room windows incorporate screens (also original) that recede into the walls. The Bachelder Tile Company out of Pasadena, CA, produced the fireplace surround tiles in the living room. These tiles showcase leaves and berries in earth tone colors, typical of Arts & Crafts style. By contrast, the three larger handmade tiles above the fireplace represent Spanish Colonial style. Downstairs, the small room to the right of the stairs originally served as a maid’s bedroom, with her tiny kitchen, washroom and a larder for cold storage across the hall. The holiday spirit of Hanukkah infuses the home of Cyd and Elliot Cohn, who purchased the 1897 Queen Anne Victorian from the Gillis/Grant family. The Grants lived in the home from 1918 to 1989, and owned the venerable Pearl Laundry that many long-time Colorado Springs residents remember. The house was more 1918 than 1989 when the Cohns moved in. With its original footprint intact, it was the perfect candidate for a major remodel. Electrical and plumbing upgrades, insulation, new windows and wall and floor refinishing provided comfort and functionality for the growing family. A small upstairs bedroom found new purpose as a master bath, while the unfinished third floor provided space for an office and a fourth bedroom. A 1993 kitchen upgrade features handmade cabinets and a Carrera marble fireplace mantle reclaimed from a St. Louis mansion. The work continues — Kiva Construction completed a second remodel of the master bathroom in June of this year. Through every improvement, the owners carefully maintained the historic look and feel of the home with trim hand-milled to match the original woodwork. The décor reflects the owners’ eclectic backgrounds and tastes. Antiques mingle with contemporary artwork, including an early 20th century Mason and Hamlin grand piano inherited from Elliot’s grandmother, an outstanding selection of Broadmoor Academy paintings and prints, and a dining room table owned by Ethel Merman! Wilfred and Clarissa Hager, members of prominent Philadelphia banking families, built the Hager House in 1905. Noted architect Thomas MacLaren designed the house and included his signature keystone motif in several mantelpieces and the archway of the formal dining room. The Hagers spared no expense when selecting materials for their Neoclassical home, shipping buff-colored bricks from Pennsylvania for the exterior walls and red slate roof tiles from Vermont. Majestic, two-story Tuscan columns flank each side of the portico front entrance to make a grand statement. The expansive porch once wrapped completely around to the west side of the house. Inside is equally imposing. The Greco-Romanesque foyer theme extends up to the second-floor hall. Talented craftsmen installed elegant wainscoting, matching ceiling beams, pocket doors, built-in bookcases and cabinets, adding rich detail to every room. Upstairs bedrooms with adjoining baths showcase original wall and floor tiles, clawfoot bathtubs and marble washstands. A two-story playhouse at the back features a functional brick fireplace. Subsequent homeowners include James and Jessie Shearer, co-owners of the former Perkins-Shearer Company clothing store, and Jane and Skip Morgan. The Morgans continue to restore this landmark home, while sharing its rich history with the community. This Queen Ann style residence was built for Charles and Bertha Emery, circa 1894. Mr. Emery was a pioneer photographer–one of his more famous assignments was to photograph President Theodore Roosevelt’s bear hunt in Colorado in 1905. After raising five children in their “pleasant home in a charming town,” both Emerys suffered tragic deaths. Bertha drowned in a flash flood, and Charles died of carbon monoxide poisoning in the garage. Their youngest daughter and family lived in the home until 1938. Current owners Kelly and Sheryl Courter purchased the house in 2006 and have worked steadily to restore the home from a sad state of disrepair to its original glory. The parlor light fixture survived the early renovations, and the home retains much of its unpainted woodwork. One set of prized pocket doors remains. The home showcases original leaded and stained glass windows, as well as transom windows above second-floor doorways. The Courters discovered the back stairway in their work to undo earlier renovations. Kelly replaced a 1980’s addition at the back of the house, taking special care to match the original architecture of the home. The new second-story addition has become the master bedroom, and the room below serves as a family TV room. This Queen Ann style home was built in 1895, with the mother-in-law cottage added in 1905. The home’s conversion into a duplex sacrificed many of the original architectural elements such as the dining room’s built-in china cabinet, as well as period light fixtures. Current owner Lori DiPasquale moved into the home in 1990 and began to deconstruct the duplex. The 1999 addition enlarged the kitchen and added a master suite on the second floor. She took great care to replicate the trim and plinth blocks and preserve the integrity of the original craftsmanship. Lori is a working artist and decorative painter. Many of the walls showcase specialty finishes such as Venetian plaster, glazes, gilding and ornamentation. Her goal has been to create a space where every visitor feels welcome and at home…a peaceful retreat, listed on Airbnb. It also serves as Lori’s art studio and classroom. Henry and Edith Meinholtz built this distinctive Spanish Revival home in 1922, after moving to Colorado Springs from Alamosa. Henry was a stockman and farmer by trade. The family lived there until Henry’s death in 1948. Cedar Springs psychiatrist Dr. Francis O’Donnell then purchased the home, and his family remained there until 1991. Present owners Tonya and Nils Venheim bought the property in 2015. One of the home’s early owners named it “Hungo Pavi”–the Native American term for grand home. Interestingly, the original deed of trust for the house includes a “Special Liquor Covenant” that states that if liquor were sold on the property the deed would become null and void, and the property would then revert to the former owner. Presumably, this covenant was written into the deed to protect the virtues of the students attending nearby Colorado College in the 1920’s. The Venheims have completed major remodeling and updating over the last 19 months, with more projects in the pipeline. The essence of Hungo Pavi has not changed much over the last 94 years, and the Venheims’ goal is to make artistic additions to the home while continuing to preserve her charm. Sheriff Winfield Boynton commissioned the original house in 1896. Boynton, a former El Paso County Commissioner, and his family enjoyed the house for two years before a massive fire completely destroyed the house in 1898. The Boynton family rebuilt their house and lived there until 1909. While house fires were a common threat in the early days of Colorado Springs, the timing of this particular fire was pivotal. City Council had just voted to implement a volunteer fire department; Sheriff Boynton convinced the council that the city needed a paid fire department. To this day, members of the Colorado Springs Fire Department credit Sheriff Boynton for saving their jobs. 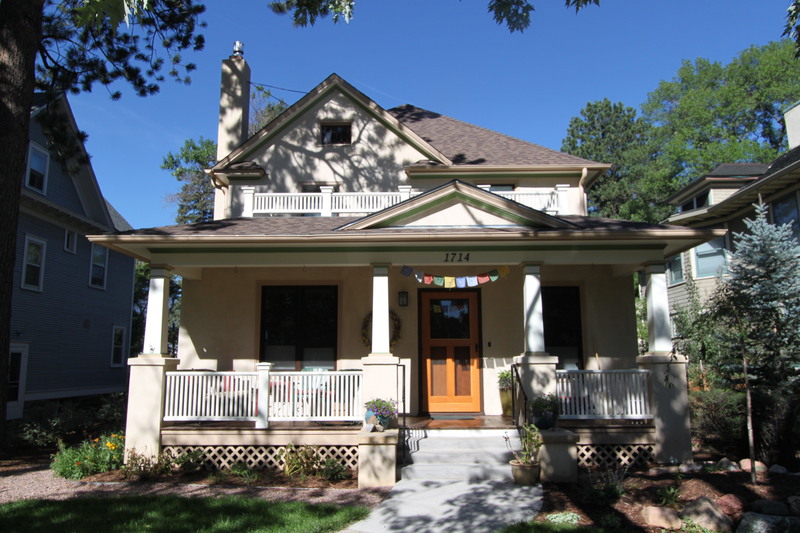 Colorado College chemistry professor Frank W. Douglas and family owned the home from 1925 to 1945. With housing at a premium during World War II, the Douglas family divided the house in half to allow for boarders. Evidence of this division remains visible in the house today. The current owners moved here in 1978. They improved and updated the house over the years, always keeping the historic context in mind. Additions include a sun room, several bathrooms, a kitchen extension, and a family room. Built in 1896, the house has been a residence to many–but none as colorful as the family of George and Blanche Trimble. An ambitious young man, George’s path to wealth began in 1875 when he married Blanche, the daughter of a judge and banker. With the judge and another friend he opened the Miner’s Exchange Bank in Leadville in 1878. And so began a long history of lucrative ventures in banking, mining, ranching, lumber, utilities, sugar beets and railroads. With George often away for months at a time, Blanche enjoyed an active social life, raising race horses and creating stunning entries for the local Flower Parades. She purchased the house in 1890, where she lived with her daughter Beulah–identified in the press as the “richest heiress in the West.” Beulah’s lavish marriage to her second husband drew national press attention, as did his attempt to murder her in the house less than two months later, allegedly over a dispute concerning his paramour. Prior to his death, George established a trust that largely benefited the Colorado Springs Elks Club. Currently valued at approximately $15,000,000, it supports the club’s service to those in need. Like many other American Foursquare houses in the area, the house has been altered over the years, including the addition of a modern day “carriage house” and beautiful crown molding. The current owners updated the kitchen, raised the roof line, added a full bath on the upper level, and remodeled a half bath on the first floor. Built in 1954, the original home was part of the neighborhood’s third wave of house construction, filling in newly subdivided lots. Byron and Lois Akers, grandparents of the current residents, purchased the home in 1971. This began more than four decades of family ownership. Byron was an editor of the Gazette in the early 1950s. After retiring from that role, he and Lois went on to establish the landmark Ghost Town in the mid-1950s. The current homeowners purchased the house in 1992. Starting in 2000, they began to remodel. The house expanded around the original 1,860 square foot structure to its present 4,400 square feet. The family lived on site the entire time! The owners did most of the work themselves, and managed subcontractors for the balance. The intense 18-month timeline called for work at night, using bright floodlights. More than once, the owners had to wave off medical helicopters trying to land, mistaking the house for Penrose Hospital! This Spanish Revival gem was built in 1926. Like many houses of its era, the original floor plan had three bedrooms and just one bath. The home’s current owners have lived in the house since 1996, managing a series of extensive remodels to add living space and improve privacy on a busy street. Each remodeling project began with the intent to preserve the home’s original features and charm. By contrast with many of the neighborhood’s Victorian houses, this house started with an easy, open flow that the owners wished to retain. The property had clearly been loved in the intervening years– the wood floors and trim were in beautiful condition, many of the original light fixtures were still in place, and the Van Briggle tile fireplace remains a focal point. Additions include the beautiful master bathroom and a highly functional closet. The remodeled kitchen serves the cook well, with unique features that include a steam oven and a wonderful sunny nook. And unlike most 1920s homes, a more informal family room sits adjacent to the kitchen. Every change and addition was made with great attention to authenticity. The owners re-used many windows and doors– there are 13 doors altogether–as well as wrought iron gates. When relocating the front door and entry, they commissioned a ceramic artist to recreate the original exterior frieze. The homeowner designed the stucco wall surrounding the property as well as the oasis of green and privacy that is the back deck; her background as an art major informs many of the home’s design elements. Visitors will enjoy the home’s extensive and eclectic art collection, and a special cactus decorated whimsically for the holidays. Trustee Eugene Percy Shove made a generous gift to the college in 1928 for the chapel’s construction, with additional support for maintenance and programming. He served the college as vice president, trustee (1914 – 1939), and two-term chairman of the board. A prominent Colorado Springs businessman, Shove played significant roles in mining, banking and the sugar industry in Colorado for half a century. After a national design competition, architect John Gray earned the commission to design Shove Memorial Chapel. Apart from small residences, the chapel was Gray’s first commission completed in his own name. While working as an architect in Pueblo, Gray was at one time associated with the firm of William W. Stickney, which designed the historic Colorado Springs Day Nursery. Listed on the National Registry of Historic Places, Shove Chapel gains recognition as an outstanding representation of the Romanesque style, as well as for its high artistic values. Master craftsmen and artists from the United States and England assisted in the chapel’s construction. Scheduled visits to the bell tower, with its commanding view of the city, will be a special highlight of the Shove Chapel tour. For additional details about the history, construction and art of Shove Chapel, please visit http://www2.coloradocollege.edu/welcome/walkingtour/shove.php. The original gate and fence welcome you to this beautiful Victorian home. 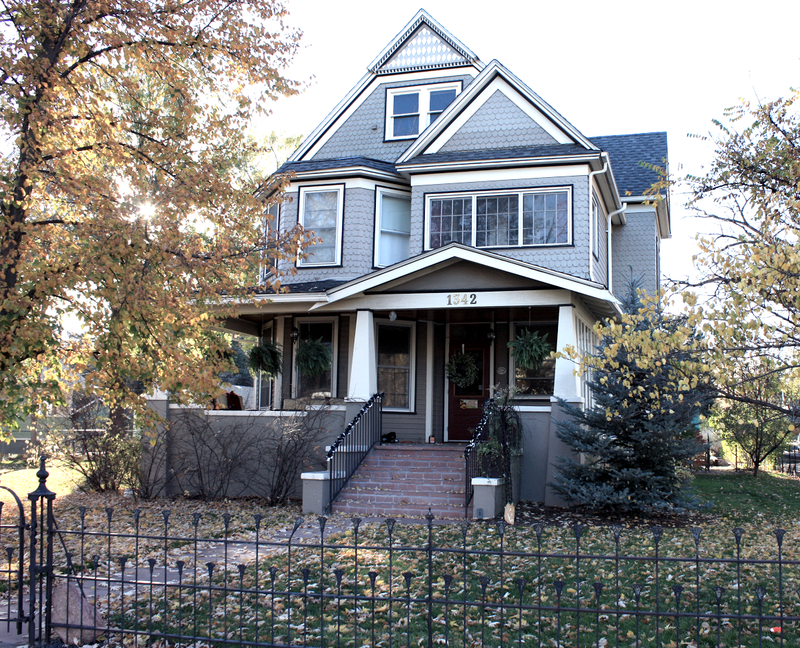 Built in 1890, it was one of the first homes on Nevada Avenue and in the Old North End. Only five families have occupied the home over the years; the Hemenway family resided here for nearly 60 years. Many of the original features still remain, including the light fixtures throughout the home. An extensive remodel in the late 1980s included a kitchen update and the addition of the gazebo in the backyard. The current homeowners moved here in 2003 and incorporated the basement, which had been turned into a separate apartment, back into the single-family dwelling. A remodel in 2010 included the restoration of the stone foundation walls. The stones were exposed, sandblasted, repointed and then sealed to reveal a beautiful architectural focal point. Thomas MacLaren built this classic Georgian square home in 1900. MacLaren was one of the foremost architects in the West. During his thirty-four years in Colorado Springs, MacLaren designed more than two hundred buildings. His body of work includes local landmarks such as City Hall, City Auditorium, Grace and St. Stephen’s Episcopal Church, the clubhouse at Patty Jewett Golf Course, Ivywild School, Pauline Chapel, Claremont (now the Colorado Springs School), Sacred Heart Church, West Middle School, Colorado Springs Fire Station No.1, Cragmor Sanitarium and the Carnegie Library in Manitou Springs. Judge Septimus J. Hanna, the home’s first resident, was a prominent figure in the early Christian Science Church. He served as editor of its publications, pastor and first reader of the “Mother Church” in Boston, as well as lecturer and teacher. Two osteopathic physicians, George W. & Lona E. Pauly, purchased the home when Judge Hanna moved to California. The piano room served as their official room for patient consultations. The Paulys’ daughter Katherine Pauly inherited the home after the deaths of her parents, and she resided there for many years. This Mediterranean-style home features seven bedrooms, seven baths, and seven fireplaces to ensure the utmost comfort for every guest. Each room is lavishly decorated and well-tended. Otto Engelking built the house in 1929 – 1930 for Mrs. Lydia (George) Leslie. The next owner was John Raymond Lowell, Jr., a Colorado College graduate and local businessman. Lowell built the Art Deco structure at 301 East Pikes Peak Avenue, another Colorado Springs landmark, in 1936 and maintained an office there. That building, which still stands today, housed one of downtown’s early grocery stores. Robert Merritt Speidel, whose family started the Speidel newspaper chain, owned the home next, followed by Sue Chilton McClure Aldridge and her son Robins Pharr Aldridge. The current owners restored many original features and made some structural changes. Special highlights of the 8,000-square-foot home include the kitchen’s “Aga” cast iron cooker, straight from an Agatha Christie novel, and a revered appliance in many European homes. The original staircase and its wrought iron railing make a grand statement, while the manicured parterre gardens and spacious solarium promise an escape from the cares of the day. Colorado Springs native Jody Crouse Zawacki consulted on the interior design and helped furnish the home with antique treasures and souvenirs from the family’s travels. The number “7” is a lucky one, and the Old North End Holiday Home Tour proudly welcomes the House of Sevens to the 2014 tour. 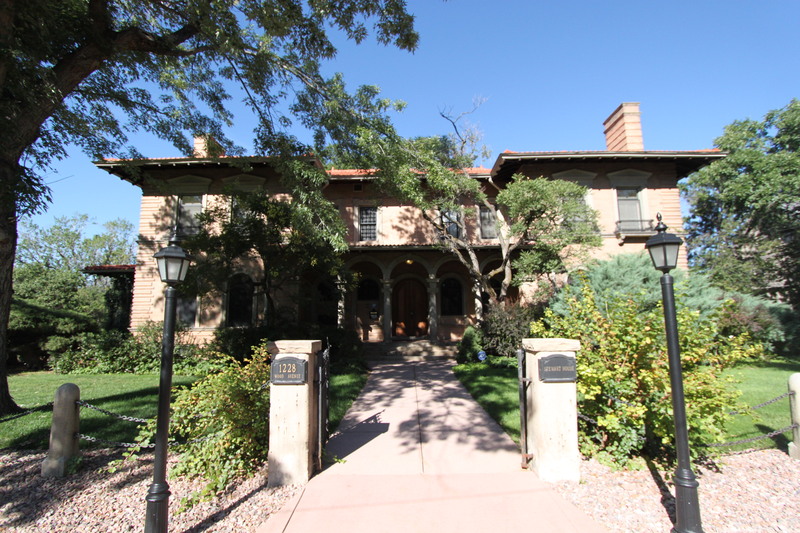 The Stewart House, is one of the earliest and grandest mansions in Colorado Springs, is named for the home’s second residents, Sarah and Phillip Stewart. Its design is an excellent example of Italian Renaissance architecture, as reflected in its masonry construction, symmetrical façade with projecting wings, arched porch, loggia, windows and entrance, and classical columns. Denver architects Frederick J. Sterner and Ernest P. Varian designed the home in 1898; this team also built the Denver and Rio Grande Railroad Depot. Original owners Ralph Preston and Elizabeth Preston, daughter of Standard Oil millionaire William P. Thompson, maintained the home for only a few short years, due to Mrs. Preston’s tragic death during the birth of their fourth child. In 1902, Sarah Cowels Stewart, daughter of one of the Chicago Tribune founders, and her husband Phillip B. Stewart, purchased the home from the Prestons for just $21,000. The Prestons, ardent supporters of Colorado College and friends of Theodore Roosevelt, helped to create much of the lore surrounding the Stewart House. Mr. Stewart shared Roosevelt’s interest in outdoor activities and accompanied him on several Colorado hunting trips. President Roosevelt slept and dined in the Stewart House in 1904, accompanied by his Secret Service detail and with local police guarding each entrance to the house. 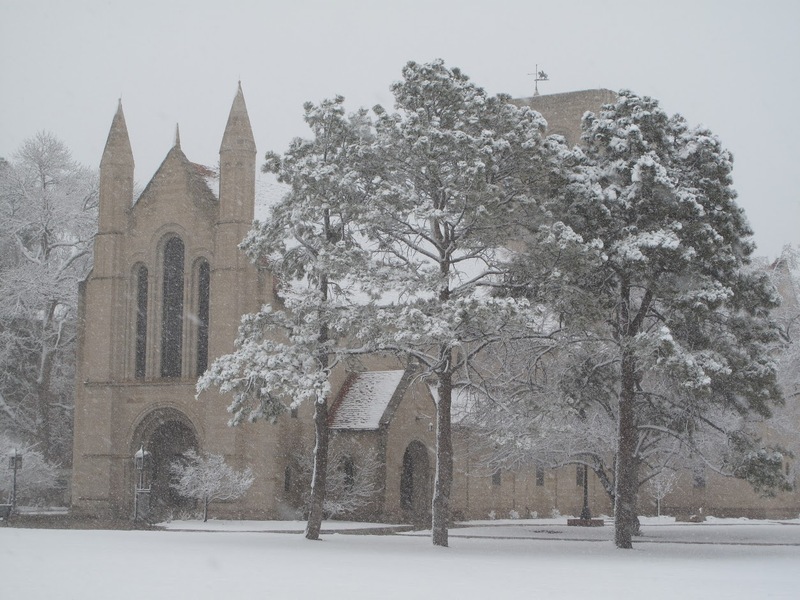 The Stewarts’ long and deep relationship with Colorado College led to the donation of the house to the college in 1957. 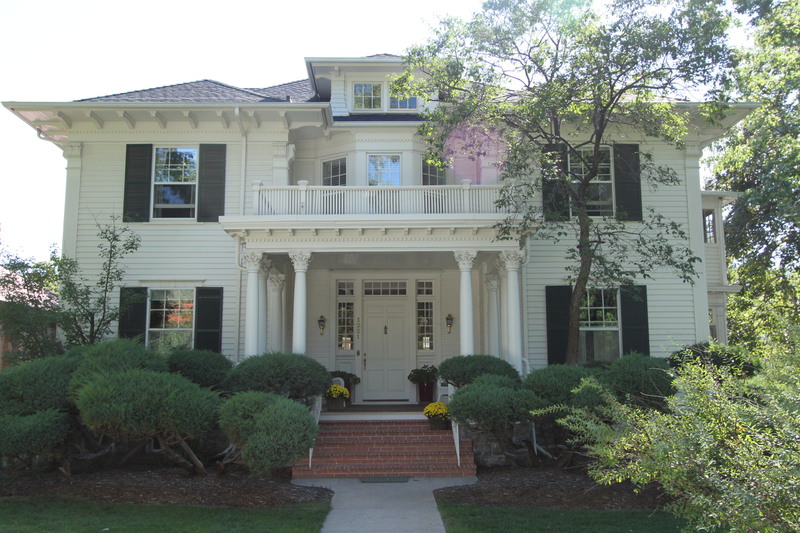 During the ensuing years, Stewart House has served as a popular venue for College and community events, and home to faculty, a college provost and a college president. Across Wood Avenue from the Stewart House, the Greek Revival foursquare home was built in 1899. Classic elements, including a symmetrical shape, Corinthian columns, bold simple moldings and narrow windows surrounding the front door, reflect the home’s Greek Revival style. Other interesting architectural elements include a magnificent Imperial (double) Staircase leading to the second floor, and a two-story tuberculosis porch on the south side of the house. Located on “Millionaire’s Row,” named for the many mining magnates who owned homes on the three southern-most blocks of Wood Avenue, this gracious home has been owned by the current residents since the 1980’s. Originally built in 1899, this home has undergone many changes in its 114 years. As is common to its Victorian heritage, this three-bedroom, two-and-a-half story home at first featured a large covered front porch. At some point, previous owners “built into the porch” to enlarge the living room and the entryway. Like so many other Old North End Victorians, this home’s original façade featured wood-shingled siding; one of its earlier transformations covered the shingle in heavy coarse stucco. Current owner extensively remodeled the home in 2011, restoring several classic features including the re-addition of a front porch and the restoration of the foyer at the front of the house. A finer-finish stucco replaced the coarse exterior. The addition and some interior details, including square columns, built-in cupboards and shelving, and a more open floor plan, incorporate Arts and Crafts elements, marrying two popular Old North End architectural styles to create an attractive, warm and functional family home. Tucked into a secluded spot by Monument Valley Park, the home is the perfect blend of old and new. The original stucco house dates to 1922, when retired Air Force Colonel Morris A. Esmiol, his wife Lucille and sons were the first occupants. Now the thick adobe walls are covered in modern wood shingles. The current residents lived in the 600-square-foot bungalow for several years before remodeling 15 years ago. The remodel, designed by historical architect Mark Nelson, is now 6,000 square feet, with many elements of American Shingle style. It includes a library, a conservatory and sunroom. The well-traveled family has incorporated furniture, art and fixtures from their destinations – especially France. These mementos mix with family heirlooms for a magazine-worthy show home. History buffs will appreciate the family’s original art from the 1899 Harriman Expedition to Alaska, local Van Briggle tile, and a lady’s inlaid desk, once owned by Julie (Spencer) Penrose. Below is a gallery of images from the 2013 Home Tour.